Update: Terz didn't quite like it. Heh. 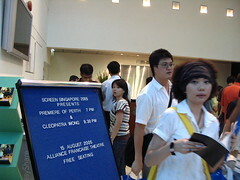 I was invited by Annie to attend the exclusive premiere of the local feature film Perth at Alliance Francaise, as part of Screen Singapore. The event was a special cast & crew and press preview screening. Annie was really helpful, taking me to meet the crew, and everyone I met was friendly. This photo is me with Djinn, the talented Singapore director, and Ivy, who plays Mai in the movie. I also met Toysrevil, fellow reservist unit mate (or so we found out at our last mob). He is the Production Designer for the movie (here are some of his photos of the movie). The film stars Lim Kay Tong as Harry Lee (I actually guffawed when the character's name was first revealed, ahem), an angry 51-year-old man who is looking forward to leaving a Singapore that has not been kind to him, and migrating to Perth (hence the title), the country of his dreams. The part-time security guard and taxi driver tries to save up money for his move to his Western Australia paradise by ferrying prostitutes. Memories flood back and things get complicated for the "simple man", or so he calls himself, especially when he develops a soft spot for Mai, a Vietnamese prostitute. The film also pays homage to Martin Scorsese's Taxi Driver. Estranged from his wife, played by Liu Qiulian, life for Harry Lee is not pretty, and neither is the Singapore portrayed here. From the streets of Geylang to the flats in Tanglin Halt, there is a sense of despair, a staleness that colours the clean Singapore we are used to seeing. Djinn kept the language spoken — a mix of English, Singlish, Malay and Hokkien dialect (most of it vulgar) — very local. And it had to be subtitled in English for an international audience, which I thought was a nice touch. Most of the local speech patterns were spot on. Of course, Singaporeans will have no problems understanding the dialogue. I found the reservist ICT bit particularly funny. The acting, especially by lead actor Kay Tong, was very good. Sunny Pang as Angry Boy Lee almost stole the show from the others. I thought some bits were a bit draggy and it affected the pace a tad, but it is still one of the best Singapore movies I have seen in a while. I am taking the wife to watch it when it commercially opens on 18 August. It is rated M18. Good stuff, go watch it and support local cinema. My Flickr set of the few shots I took at the event is here.